New York: Frederick A. Stokes Company, 1937. Decorative Cloth. Collectible; Very Good/Very Good. 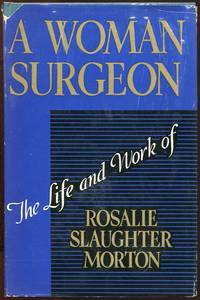 INSCRIBED BY ROSALIE SLAUGHTER MORTON below her frontispiece portrait. A solid copy to boot of the February 1937 stated 5th printing. 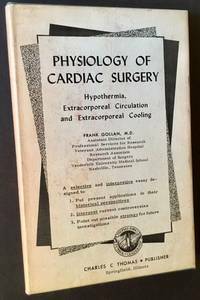 Tight and VG (with very light rubbing to the front panel) in a bright, price-intact, VG dustjacket, with light chipping at the spine ends and very light scuffing to the front panel. Thick octavo, 399 pgs. Signed by Author. New York: Rebman Company, 1906. 1st. Cloth. Collectible; Fine. A clean, very sharp copy of the 1906 1st edition. 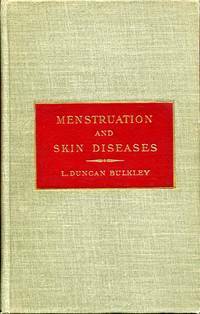 Tight and Near Fine in its olive cloth, with bright gilt-lettering at the front panel and spine. Octavo, 108 pgs. New Delhi: Oxford & IBH Publishing Co, 1970. 1st. Cloth. Collectible; Fine. A nice Assciation copy: WARMLY INSCRIBED BY THE AUTHOR M.S. RANDHAWA TO FORMER AMBASSADOR TO INDIA CHESTER BOWLES. A sharp copy to boot of the 1970 1st edition. Clean and Near Fine in its dark cloth, with bright gilt-device and lettering along the front panel and spine. Octavo, 185 pgs. Signed by Author. By Abner I. Weisman, M.D. New York: Paul B. Hoeber, Inc, 1941. 1st. Cloth. Collectible; Fine/Very Good. A solid copy of the 1941 1st edition. 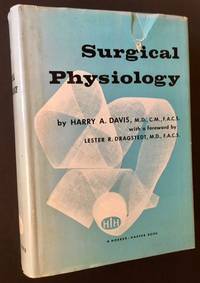 Tight and Near Fine in a bright, price-intact, VG dustjacket, with lguth creasing at the flap-folds and light chipping to the spine crown. Thick octavo, 314 pgs., including 77 illustrations. New York: Alfred A. Knopf, 1931. 1st. Decorative Cloth. Collectible; Fine/Very Good. A handsome copy of the 1931 1st edition. Tight and Near Fine in a clean, VG dustjacket, with very light chipping at the spine ends and the tips. 12mo, 317 pgs. plus Index. New York: Academic Press, 1951. 1st. Cloth. Collectible; Fine/Very Good. A tight, solid copy of the 1951 1st edition. Clean and Near Fine in a bright, VG+ dustjacket, with very light rubbing along the panels. Thick octavo, 707 pgs. London: Trubner & Co, 1868. 1st. Cloth. Collectible; Fine. A handsome copy of the 1868 true 1st edition. Clean and Near Fine in its russet cloth, with bright, completely unflecked gilt-lettering at the front panel. Small former owner name to the front free endpaper, otherwise clean as could be. 12mo, 103 pgs. New York: The Macmillan Company, 1938. Cloth. Collectible; Very Good. The 1938 1st American edition. Solid and VG in its blue cloth, with bright gilt-lettering along the spine. Octavo, 195 pgs. New York: Rebman Company, 1913. 1st. Cloth. Collectible; Very Good. The 1913 1st edition. Solid and tight and VG+ in its gray cloth. Octavo, 329 pgs. 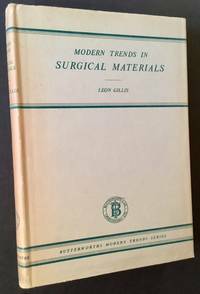 "Adapted and edited, with additions on the diagnosis of the diseases of the esophagus; diagnosis of the diseases of the gastro-intestinal tract; duodenal tube and its uses; diseases of the pancreas, and x-ray examinations of the gastro-intestinal tract by Michael H. Gross, M.D. and I.W. Held, M.D." Springfield, IL: Charles Thomas, 1948. 1st. Hardcover. Collectible; Very Good/Very Good. The 1948 1st edition. Solid and VG in a bright, VG dustjacket, with very light soiling to the panels and light foxing (and offsetting) to the endsheets. Octavo, 241 pgs. 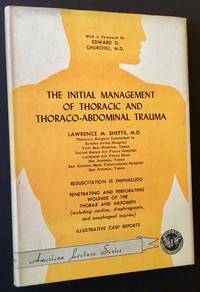 By Lawrence M. Shefts, M.D. Springfield, IL: Charles C. Thomas, 1956. 1st. Cloth. Collectible; Very Good/Very Good. The 1956 1st edition. VG (with light offsetting at the gutters) in a crisp, VG dustjacket, with mild darkening along the spine. Quarto, 121 pgs. Part of Charles Thomas's wonderful "American Lecture Series"
New York: Paul B. Hoeber, Inc (Harper & Row), 1957. 1st. Cloth. Collectible; Very Good/Very Good. The 1957 1st edition. Solid and VG+ (with light offsetting at the gutters) in a bright, VG dustjacket, with light foxing along the front fold and a 1 1/2" closed tear at the front panel's top-edge. Still though. a perfectly presentable copy. Thick quarto, 841 pgs. Springfield, IL: Charles Thomas, 1959. 1st. Cloth. Collectible; Very Good/Very Good. The 1959 1st edition. VG (with foxing to the gutters and along the fore-edge) in a crisp, VG dustjacket, with light foxing at the front panel. Octavo, 96 pgs. By Harold J. Stewart, M.D. And Frank Glenn, M.D. Springfield, IL: Charles C. Thomas, 1959. 1st. Cloth. Collectible; Fine/Fine. A crisp, clean copy of the 1959 1st edition. Tight and Near Fine in a bright, Near Fine dustjacket. Octavo, 244 pgs. London: Butterworth & Co, 1958. 1st. Cloth. Collectible; Very Good/Very Good. The 1958 1st edition. Tight and VG (with foxing at the endsheets and pastedowns) in a bright, VG+ dustjacket, with mild darkening along the spine. Octavo, 266 pgs. plus index. By Horatio R. Bigelow, M.D. Philadelphia: The F.A. Davis Company, 1894. 1st. Cloth. Collectible; Fine. A sharp, well-preserved copy of the 1894 1st edition. Clean and Near Fine in its dark-green cloth, with bright gilt-lettering along the spine. Thick octavo, dozens and dozens of steel engravings of new-to-the-market medical instruments and medicines complementing the text. Nice, France: Le Corps Medical, Les Societes Savantes et La Presse. 1st. Original Wraps. Collectible; Very Good. Uncommon French dental booklet featuring this turn-of-the-century gas-conveying machine called "Le Gazotherme". C. 1900. VG in its pictorial stapled wrappers. Octavo, 29 pgs., 2 crisp black-and-white photos of the monstrous-looking " Gazotherme". Text in French. Very unsual. London: Rider & Co. Cloth. Collectible; Very Good/Very Good. 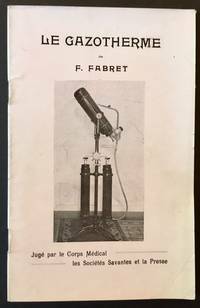 The 1st edition, c. 1920, of this curious study of color in its approach to treating disease. 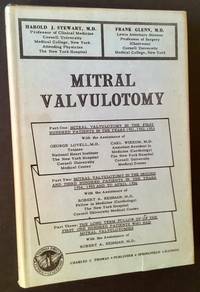 VG (with tender but still firm inner hinges) in a clean, VG example of the uncommon original dustjacket, with one small closed tear at the front panel. 16mo, 80 pgs. 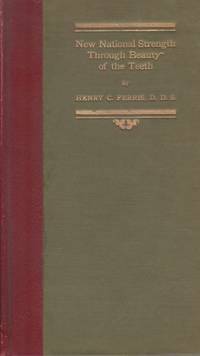 By Henry C. Ferris, D.D.S. New York: Self-published, 1919. 1st. Cloth. Collectible; Fine. 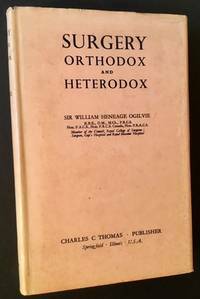 1919 1st edition of this uncommon --and wild-- self-published argument by New York orthodontist Henry Ferris that proper dental health and natonal strength go hand-in-hand. Clean and Near Fine in its duotone cloth, with bright gilt-lettering to the front panel. 12mo, 46 pgs., crisp black-and-white photos at the rear. Also includes the good doctor's E. 40th St. business card laid-in. Philadelphia: Henry C. Lea, 1874. 1st. Cloth. Good. 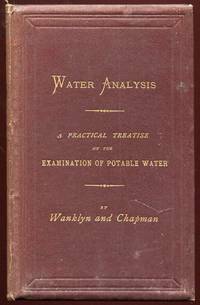 The 1874 1st edition. G+ in its blue cloth, with offestting at the front panel and first bland endpapers, fading along the spine and some wear along the outer hinges and rear inner hinge. Still though, a serviceable copy. Thick octavo, 574 pgs. plus publisher's catalogue.